Citation Information: J Clin Invest. 2005;115(12):3409-3417. https://doi.org/10.1172/JCI25040. During intravascular hemolysis in human disease, vasomotor tone and organ perfusion may be impaired by the increased reactivity of cell-free plasma hemoglobin (Hb) with NO. We experimentally produced acute intravascular hemolysis in a canine model in order to test the hypothesis that low levels of decompartmentalized or cell-free plasma Hb will severely reduce NO bioavailability and produce vasomotor instability. Importantly, in this model the total intravascular Hb level is unchanged; only the compartmentalization of Hb within the erythrocyte membrane is disrupted. Using a full-factorial design, we demonstrate that free water–induced intravascular hemolysis produces dose-dependent systemic vasoconstriction and impairs renal function. We find that these physiologic changes are secondary to the stoichiometric oxidation of endogenous NO by cell-free plasma oxyhemoglobin. In this model, 80 ppm of inhaled NO gas oxidized 85–90% of plasma oxyhemoglobin to methemoglobin, thereby inhibiting endogenous NO scavenging by cell-free Hb. As a result, the vasoconstriction caused by acute hemolysis was attenuated and the responsiveness to systemically infused NO donors was restored. These observations confirm that the acute toxicity of intravascular hemolysis occurs secondarily to the accelerated dioxygenation reaction of plasma oxyhemoglobin with endothelium-derived NO to form bioinactive nitrate. These biochemical and physiological studies demonstrate a major role for the intact erythrocyte in NO homeostasis and provide mechanistic support for the existence of a human syndrome of hemolysis-associated NO dysregulation, which may contribute to the vasculopathy of hereditary, acquired, and iatrogenic hemolytic states. Characteristics of the canine free water hemolysis model. 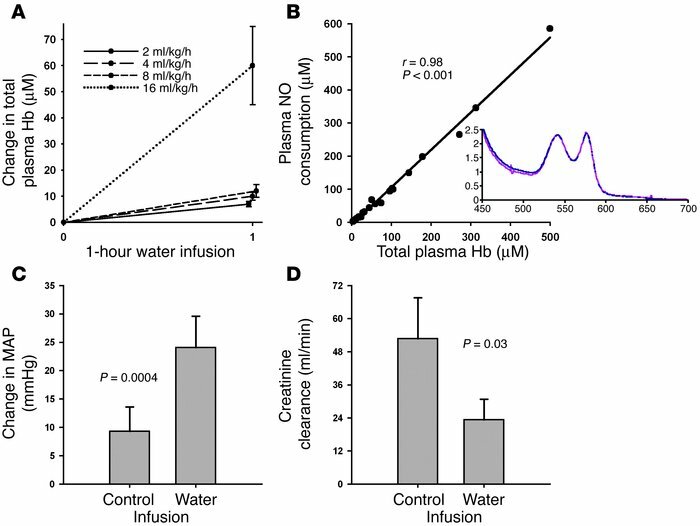 (A) Increasing rates of free water infusion caused increased rates of hemolysis with higher total plasma Hb levels (concentration in terms of heme groups). (B) The amount of plasma Hb (concentration in terms of heme groups) released by free water–induced intravascular hemolysis remained ferrous (HbFeII-O2) and correlated with the ability of the plasma to consume NO in a 1:1 stoichiometric ratio (r = 0.98; P < 0.001). The inset represents a sample spectrum of the Hb species in the plasma, which demonstrates that the cell-free plasma Hb consists predominantly of oxyhemoglobin. (C and D) Compared with 6-hour control infusions (D5W and normal saline combined), 6-hour infusions of free water caused a significant increase in MAP (C; P = 0.0004) and a significant decrease in 6-hour creatinine clearance (D; P = 0.03) from time 0.